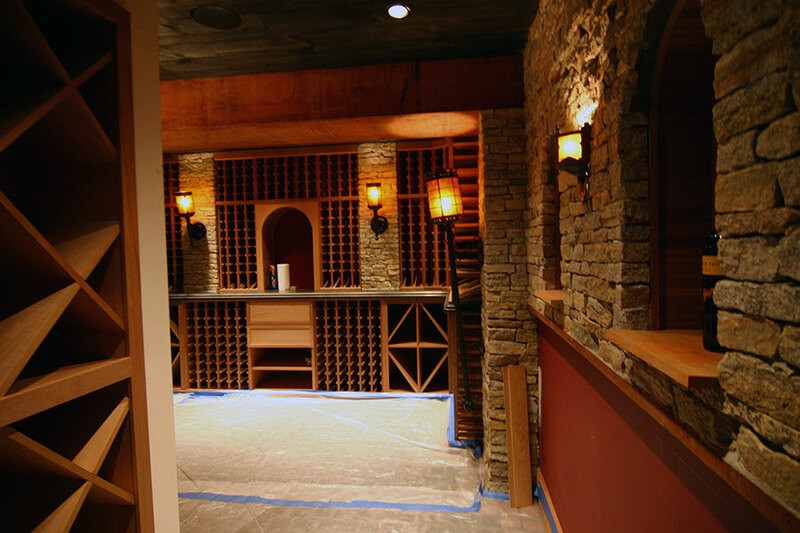 Whether you have a closet to convert to wine storage, or a complete room you'd like to turn into a wine cellar, our wine cellar Design Consultants can help you fulfill your wine storage dreams. 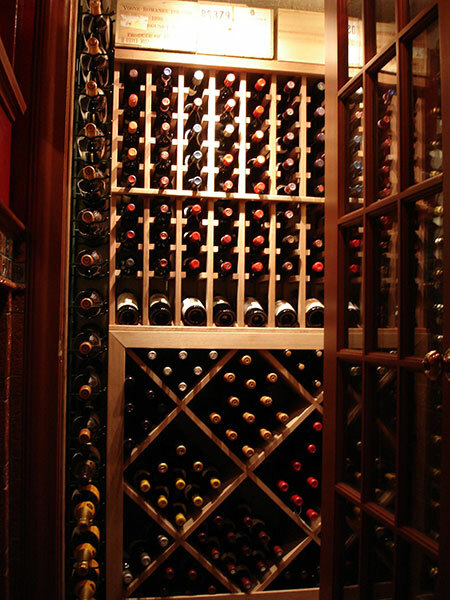 No matter what your needs, budget or concerns are, our team at WineRacks.com will assist you every step of the way. We take pride in assisting our customers from the initial idea stage to the final nail and continuing through with our lifetime warranty against defects in both workmanship and materials. 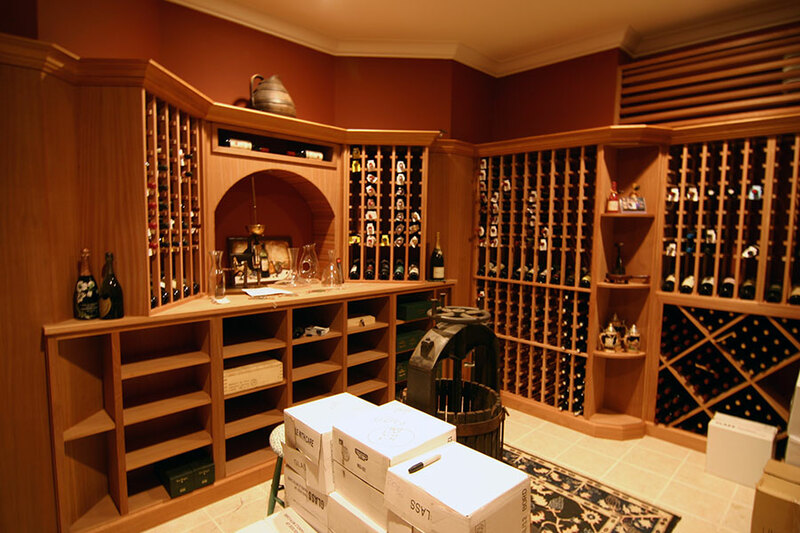 Your wine and proper storage needs are an investment that we take seriously and we look forward to making it an enjoyable experience through attention to detail and most importantly, attention to our customers. 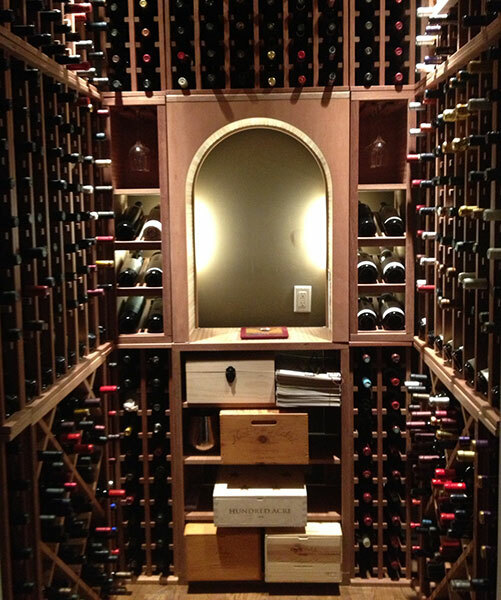 That is what has made WineRacks.com the choice of thousands of private customers, world-class restaurants, hotels, nightclubs, casinos, retail wine stores, country clubs and many more since 1992. 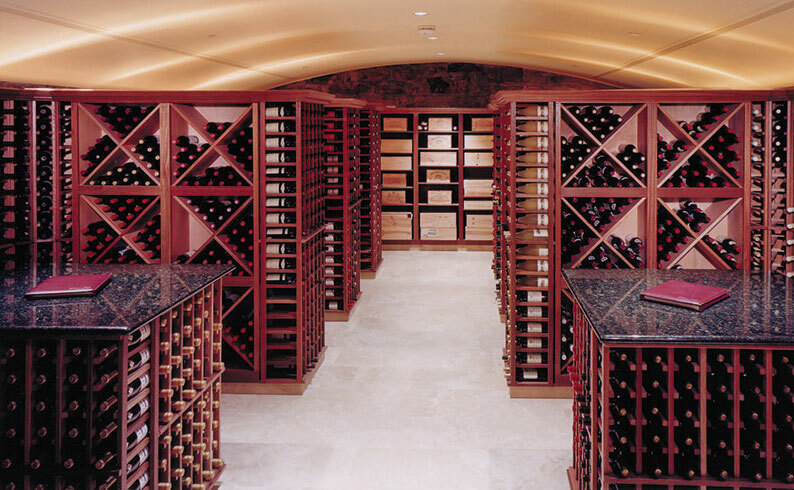 Request a Cellar Design Today! 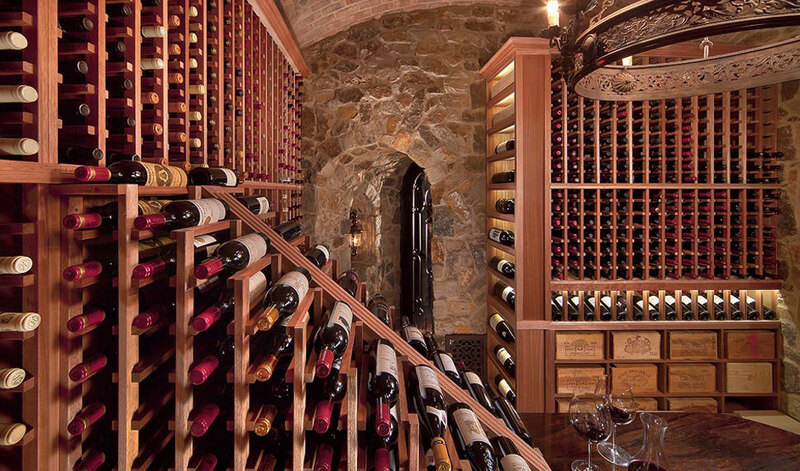 Our Design Experts will guide you each step of the way to create the perfect cellar to suit your design needs and budget. 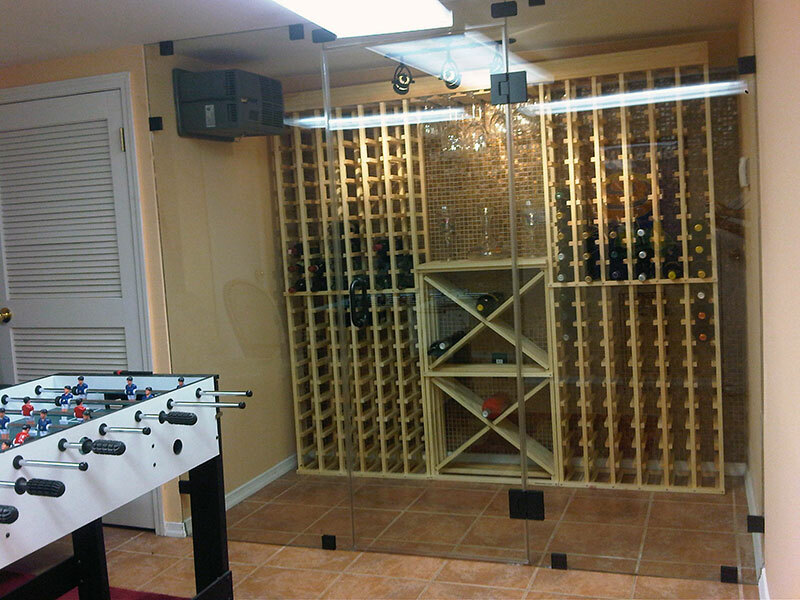 WineRacks.com is an Authorized Dealer for several environmental control solutions. 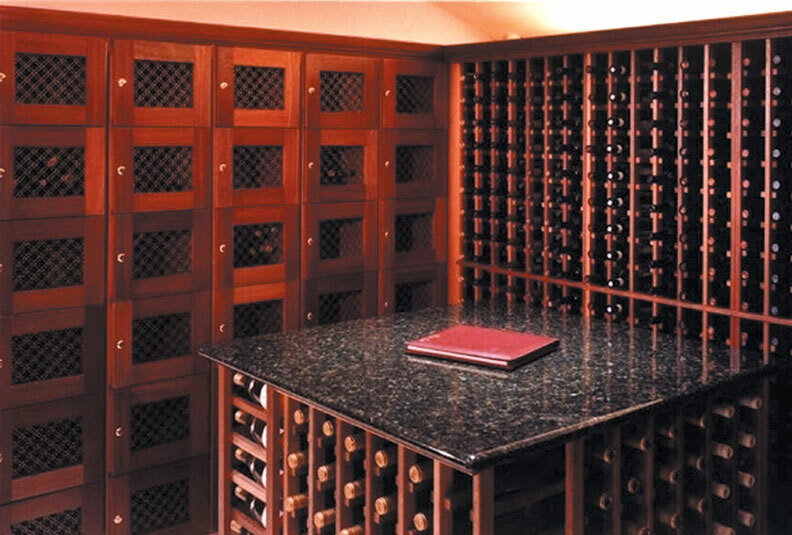 If you need a complete self-contained wine cellar solution we offer Vinotheque cabinets. For built-in cellar cooling we offer economical WhisperKOOL units that can be installed through the wall, ducted or in split configuration. 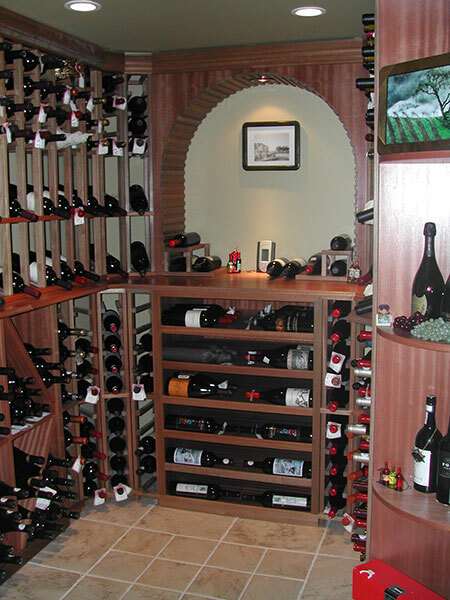 Our top-of-the-line cooling systems come from WineGuardian. They are built with commercial grade components and also come in through the wall, ducted or split configurations. 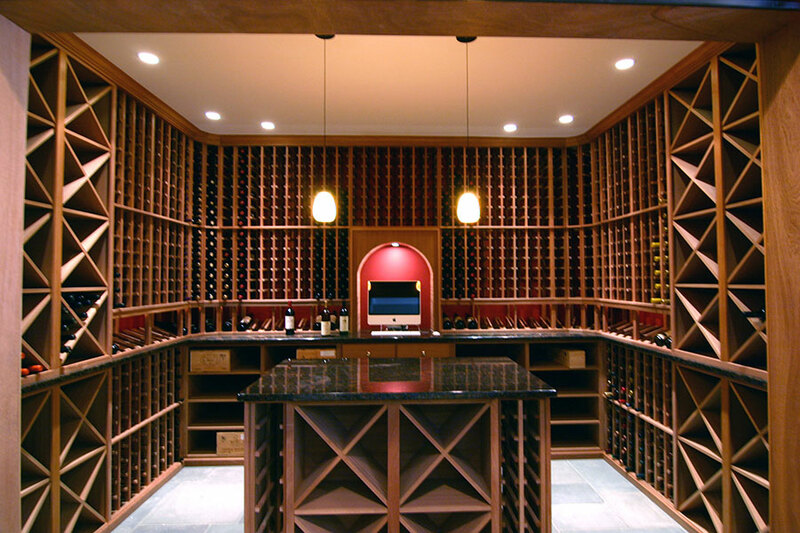 Our LED lighting solutions are custom made to be integrated into our wine rack and cellar designs to complement the quality and functionality of each unique racking system with a wine-safe, professionally lit finish. Whether linear, spotlight or light pool effects, LED lighting creates an evenly lit space with appropriate highlights of bottles, shelves or room elements. All the low-profile lights are designed so that you see the effect but not the fixture. These dimmable lights offer brightness control for luminosity that is always perfect. Wine safety is critical: LED lights use 80% less power, produce no UV radiation, generate almost no heat and offer a 50,000-hour lifetime that virtually eliminates the need for replacing the lights. 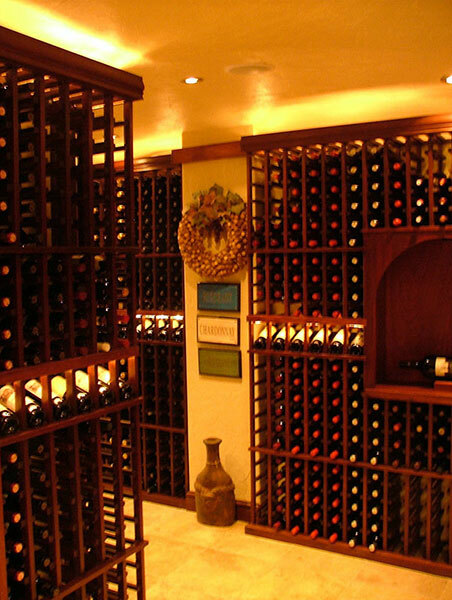 These are just a few samples of some of our Wine Cellars. 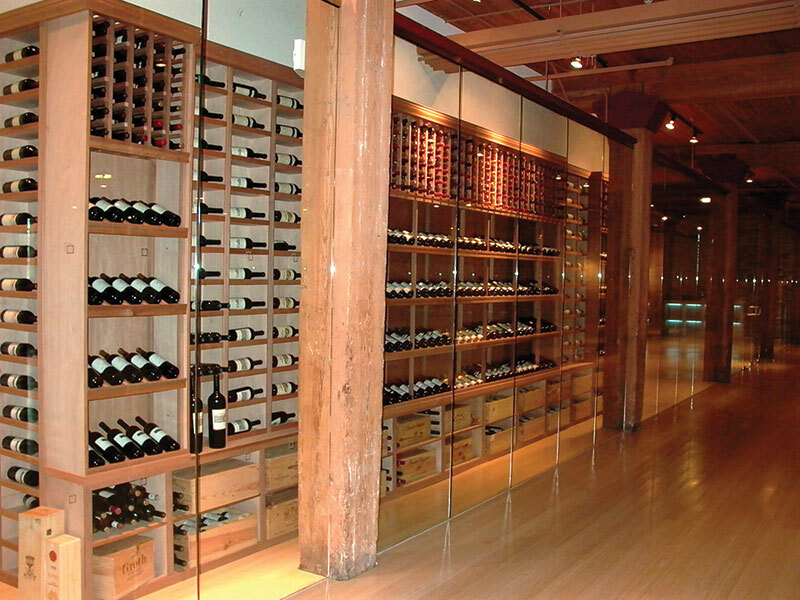 Some are completely custom and others were constructed using our Premium Series Cellar Racking. Click on Thumbnails for larger images and descriptions. Click large photo for controls to view slideshow. 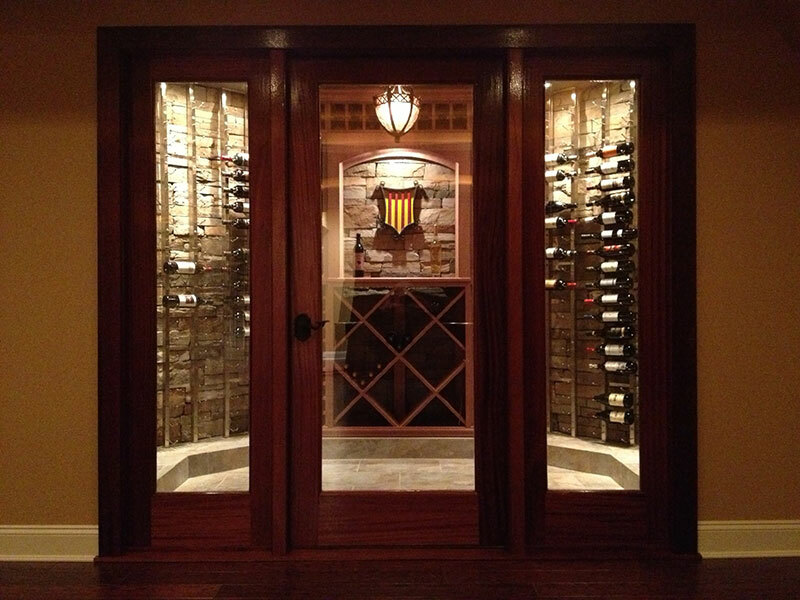 I have used WineRacks.com for two distinctly different cellars. Each one was a unique space and WineRacks.com was able to make them look beautiful while maximizing my bottle storage. 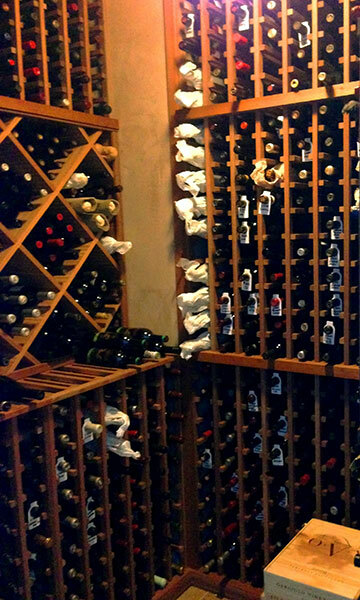 I feel like I need to wear white gloves when I walk into the cellar because it's that special. 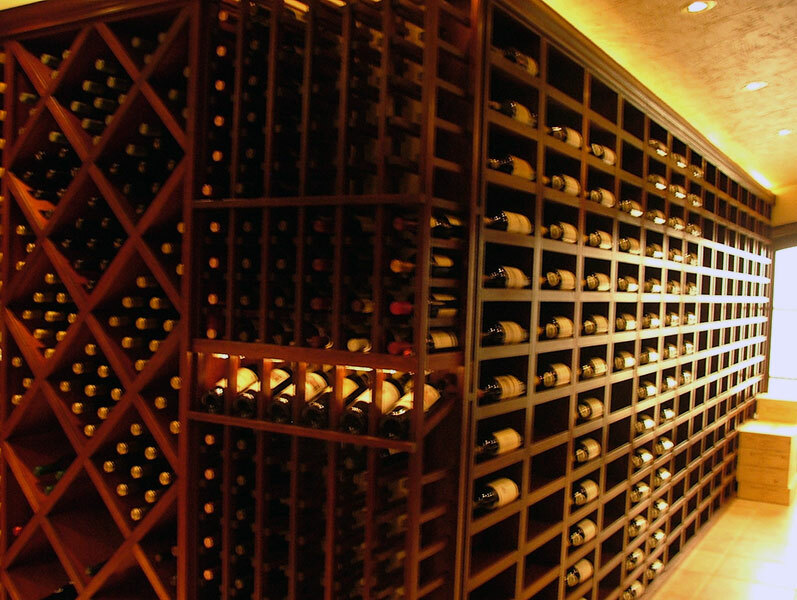 WineRacks.com worked with us greatly to create our ideal wine cellar as a hybrid cross between the conventional wood racks and more modern racks. The cellar turned out great thanks to WineRacks.com's persistence and tireless efforts to assure that we are more an satisfied with the final outcome. 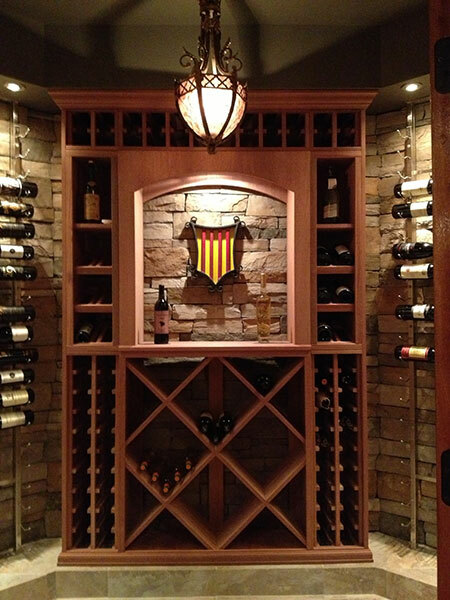 The metal racks went so well with the stone background, and the capacity of the cellar was perfect for our collection of wines. We could not have been more happy with the final outcome and with WineRacks.com's hard work to give us a cellar to last a lifetime! We had a small, odd-shaped, unfinished room in our basement and we didn’t know what to do with it. After some thinking, my wife and I decided to turn it into a wine cellar. 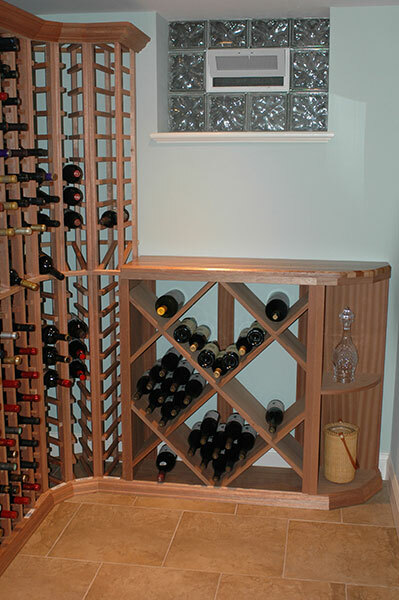 A friend of mine who works closely with builders in the area suggested Wineracks.com. 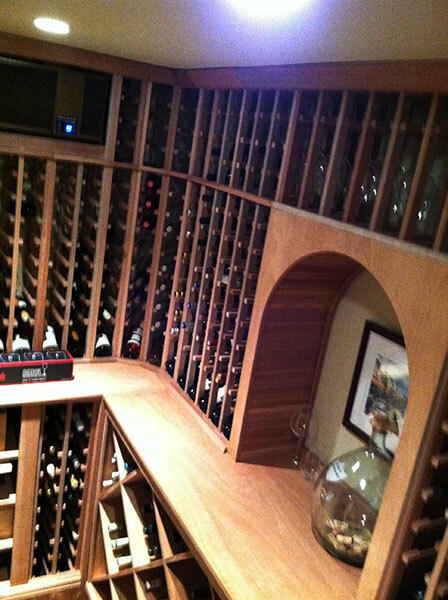 I sent their designer the dimensions of the room and together, we came up with a wine rack design for the room. The designer was patient with me as I reviewed several designs and made changes. We eventually came up with a design that fit the room and looked great. I had never done a project like this before so I had a lot to learn. As always, the project took longer than I thought it would but it was a side project I did when I had time. I am very happy with the results and want to thank Wineracks.com and their staff for their help in the successful completion of this project. We purposely searched out an American made product. The WineRacks.com product line is American made, the company provides terrific customer service and creative design solutions if you need them. The product line offers plenty of standard shapes which should satisfy most layout needs, a great variety of woods and finishes if your project calls for it. I'm looking forward to doing more projects with them. I am definitely satisfied with my wine racks. They are great quality and fit perfectly in the space. I was also impressed with the color of the natural mahogany. I was half expecting to have to stain them, but they looked perfect as is. I had someone install them for me and it took them less than a day. I rushed home early from work to stock them up! 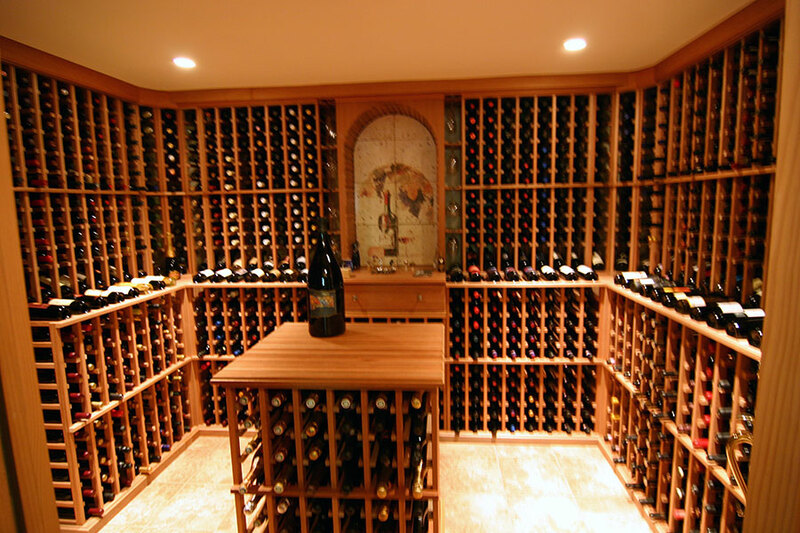 My wife and I couldn't be happier with the white glove service & treatment we received from everyone at WineRacks.com during the entire process of our home wine cellar installation. The initial design process was very interactive and helpful, as the designer was very attentive to our needs. She offered excellent suggestions to add design features that we weren't aware of, always working with our budget. The company Vice President added his more than qualified suggestions & added personal attention that we did not receive at any other company. 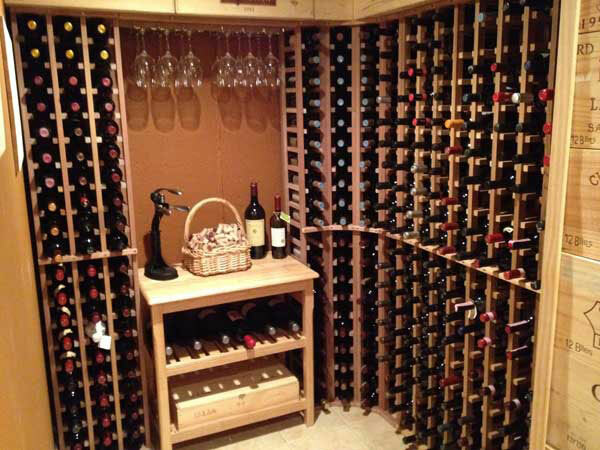 He sent out wood samples and detailed the white glove installation service, which made our decision to work with WineRacks.com a no brainer. 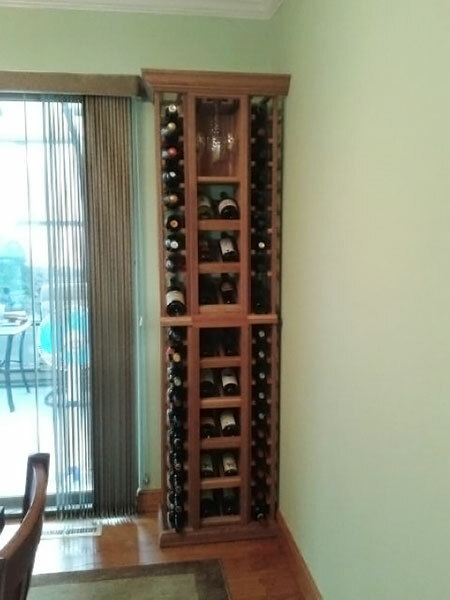 All in all, WineRacks.com exceeded our expectations at all times, and we are extremely happy with the finished product. 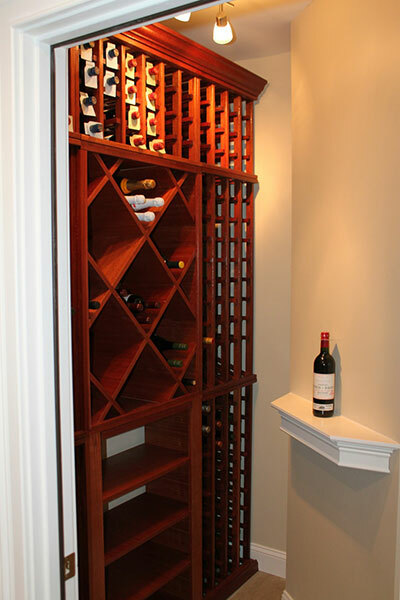 We would recommend them to anyone considering a residential or personal cellar. 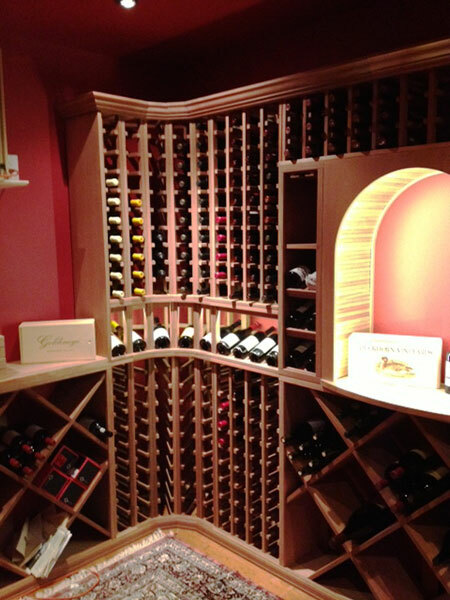 We will have many years of joy & fine wine to come from the new Greier Wine Cellar, established April 2012, designed & installed by WineRacks.com! 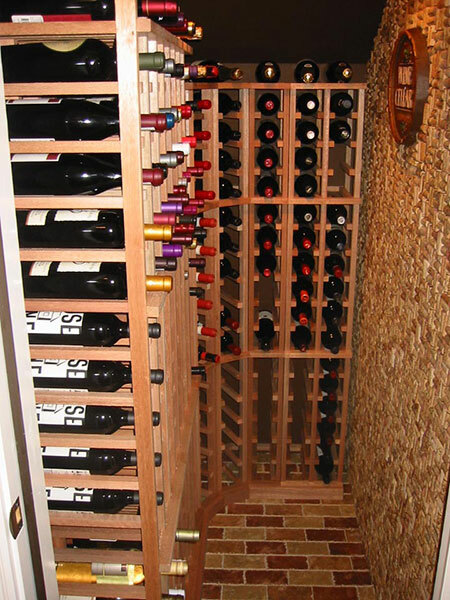 I recently decided to expand my wine cellar because I ran out of room in my racking and boxes were accumulating on the floor. 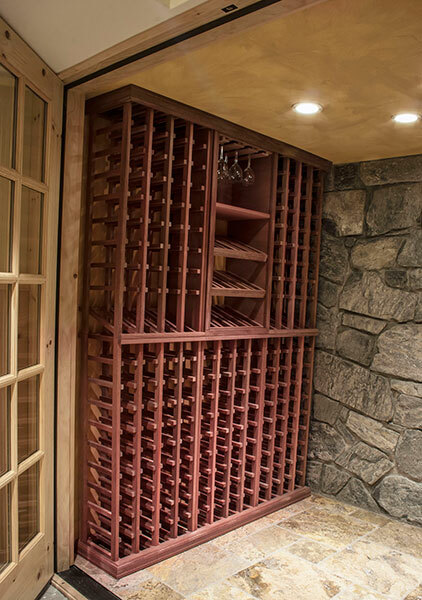 I went back to WineRacks.com, as I was happy with their product when I built the cellar a few years ago. I had both timing and technical issues to get the project done quickly before the Thanksgiving holiday dinner we were hosting. WineRacks.com did not disappoint. Their customer service, craftsmen and executive staff all got involved in problem solving and advice to help me get the project done on time. It came out great, and I am thankful for both the quality of their products and their concern for the customer who will use them. I will be a customer for life! The racks came out beautifully. I was very impressed with your customer service. I have recommended your product to several others. Just ordered, built and installed my racks. Super quick to assemble, excellent quality, and beautifully built. I could not be happier! Thanks guys. WineRacks.com... What a great find! 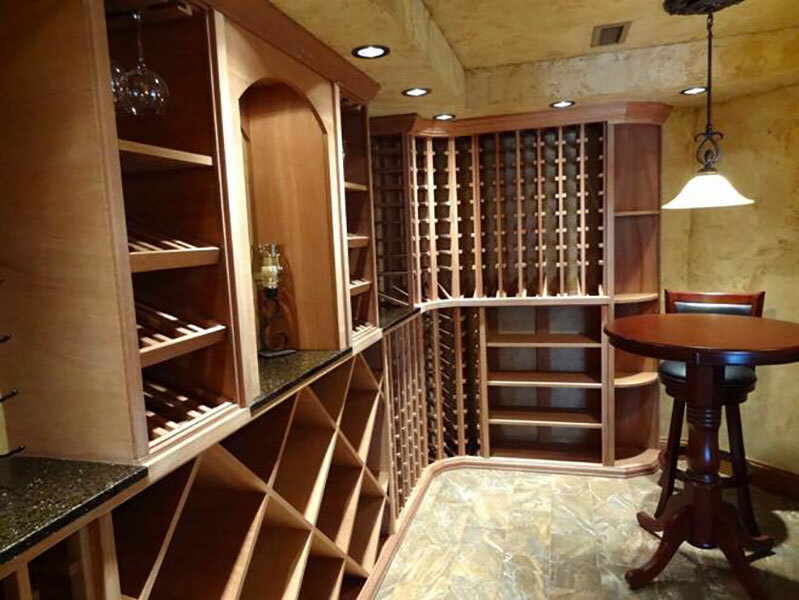 I found many “Custom Wine Rack” builders on the internet and in Wine Enthusiast Magazine and I called or emailed several to get information on fabricating a custom cellar for me. Some never replied and others were less than professional. I finally settled on the three that seemed to be the most professional. I provided my basic needs and the dimensions of the space that I had to work with to all three. I did in all fairness get responses from all three but that is where the similarities end. Two provided very basic cellar designs with prices and indicated that if I wanted anything further there would be a design fee. Then you have the sales rep from WineRacks.com. What a star. She provided the initial consultation and then did several revisions to get to EXACTLY what I was looking for. Once we had the design I wanted, she provided a very attractive price. I felt very comfortable when it came time to sign on the dotted line and give WineRacks.com a deposit. They delivered the cellar in the timeframe they promised and when I found that I needed a couple of extra pieces of trim and spacing material they sent it promptly at no charge. A few weeks later I decided that I wanted to add a custom stemware rack. I again enlisted my WineRacks.com sales rep and she whipped up a custom design for me in minutes. 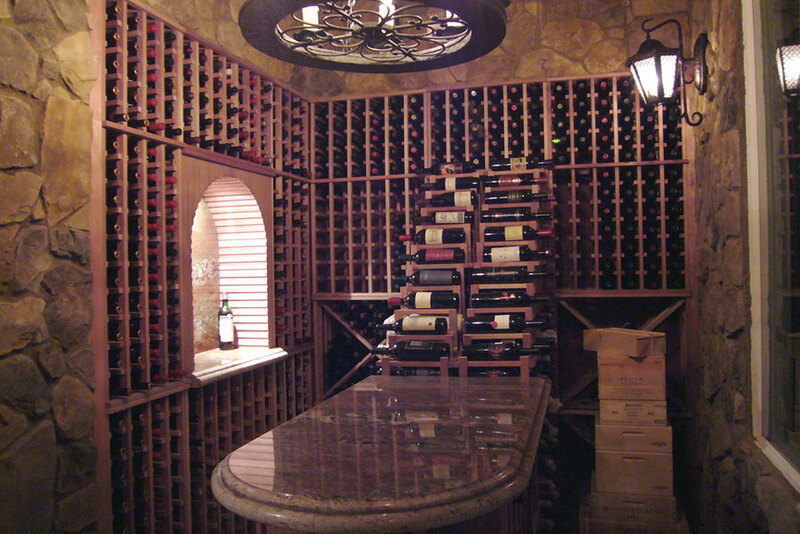 I gave her the go ahead and bingo, two weeks later the stemware rack is hanging in my cellar! If you are looking for quality and professional service WineRacks.com is the place to call. 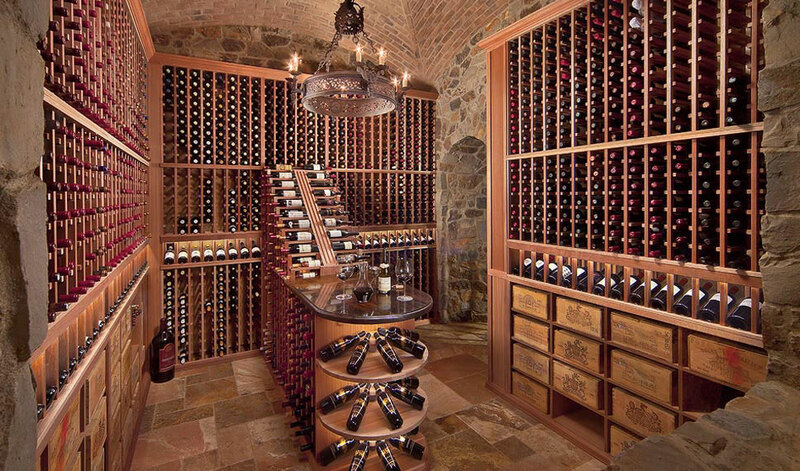 I wanted to let you know again how pleased I am with the way my wine room has turned out. I greatly appreciate your assistance with the project. From the time I first called you to ask about your wine racks you have been a big help. I had a rough idea of what I wanted to do with the room and you were able to help me translate that idea into a working plan, using your components. It was a bit of a job to assemble the racks, but they went together very nicely and after two days I had the racks installed and have been enjoying my new wine room ever since. I was very impressed with the quality of the components as well as the great service. Additional revisions beyond the first design revision will require a minimum deposit of $125. The design fee will be applied as a credit toward your final purchase. We will respond via email within 24 hours of receiving your inquiry if you submit your form Sunday through Thursday. Please check your junk/spam folder as sometimes our replies get sorted there. We may have some additional questions for you before we can start a design. Designs typically take 48 to 72 hours. If you don't hear from us, feel free to call us at 845-658-7181. If you would prefer to print this guide, you can download a PRINTABLE VERSION HERE. Fax your completed form to 845-658-5309. What is the overall intent of your cellar? 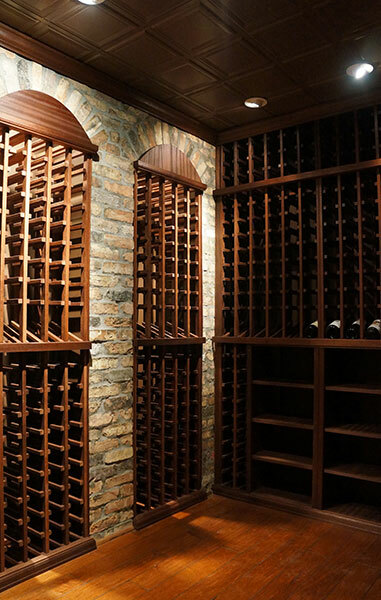 How many bottles of wine are you planning to store? How would you describe your budget? I'm looking for the best quality and design and price isn't the main deciding factor. I'm on a tight budget and every dollar counts I'd like to be practical, but I'm willing to spend a little extra on the right design if necessary. Is this new construction or an existing space? What phase of construction are you currently in? 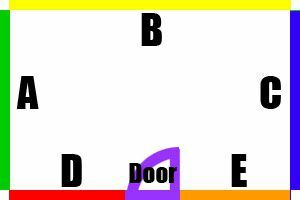 Please note: Wall D should be the wall with a door if one exists. Please provide 3 measurements: the wall on either side of the doorway and the doorway opening itself. I have an odd shaped room and will be faxing a layout after I complete this form to 845-658-5309. Do you have any obstructions in the room? Will you need a cooling unit? Will you need a humidifier? What type of cooling unit do you need? Please describe where the cooling system will be located. 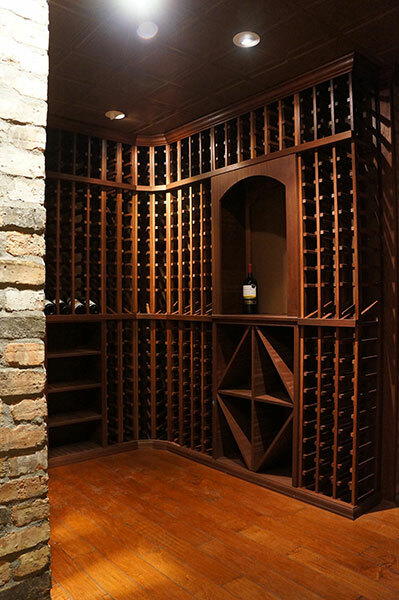 Our Premium Series Cellar Racking lets you build a custom-looking wine cellar without the custom price. 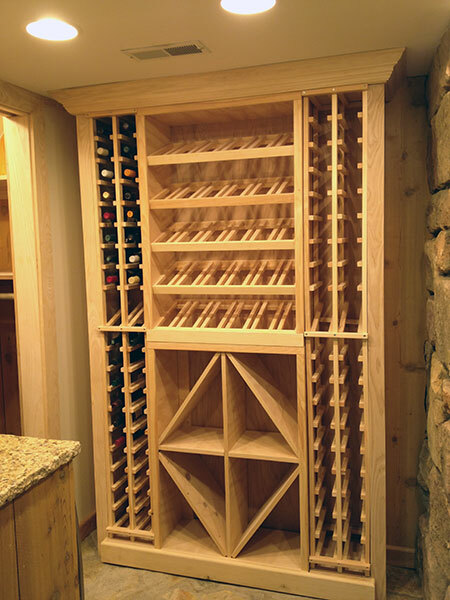 Premium Series racking is available in Mahogany, Oak, and Pine; is built to a height of 77 1/4" and a depth of 12 3/8" to fully support your wine bottles. These racks have "custom" features like a display angle in the individual bottle racking to show off the labels of your special bottles. 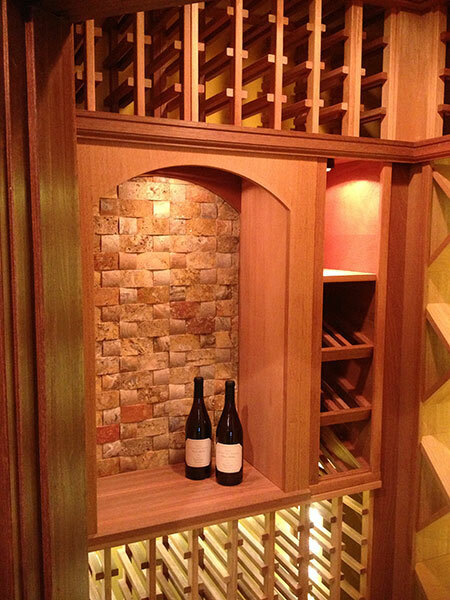 Coordinating cabinetry pieces, crown moulding and toe kick allow you to create a true "built-in" look for your cellar. 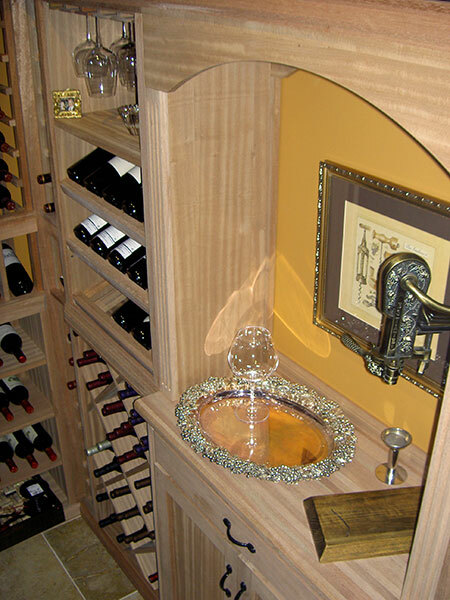 WineRacks.com Custom Racking conforms exactly to your specifications. 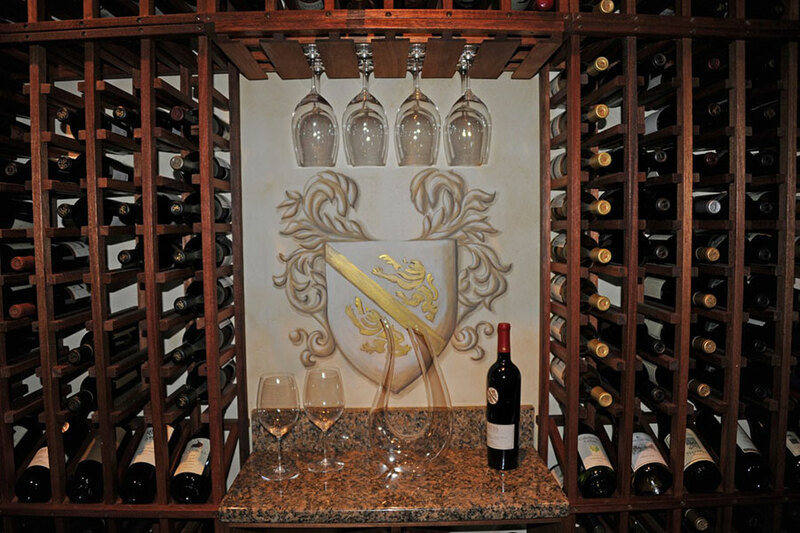 Our custom wine racks are constructed at a depth of 12 3/8" to fully support your wine bottles and feature such options as crown moulding, toe kick, and a display angle to show off your special labels. 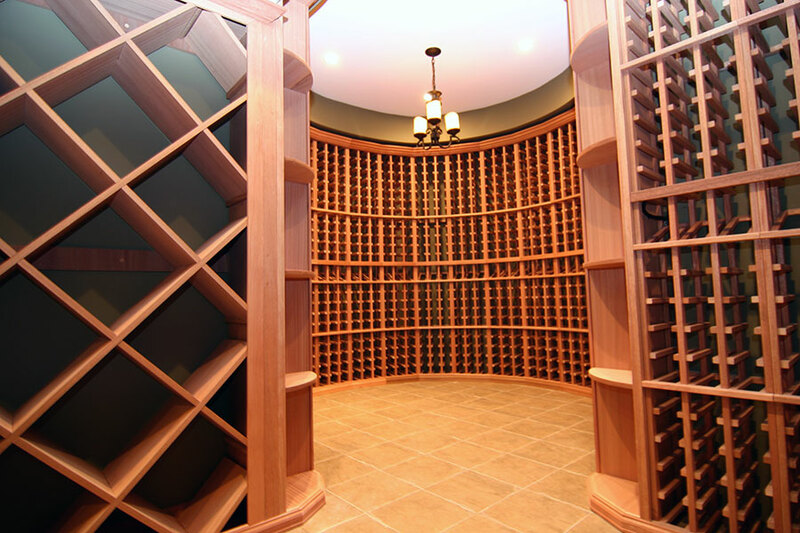 We can build racking to any height you desire and can provide you with lighting, flooring and custom doors to highlight your cellar. Custom racking is available in Mahogany or Oak, or we can special order other species. Racking is simple to assemble on-site with instructions provided. Custom racking generally requires nail-gun assembly, or it can be ordered for screw assembly like our Premium Series. What wood species would you prefer? What style of racking would you prefer? Any other special notes on racking? Would you be interested in our White Glove Service? 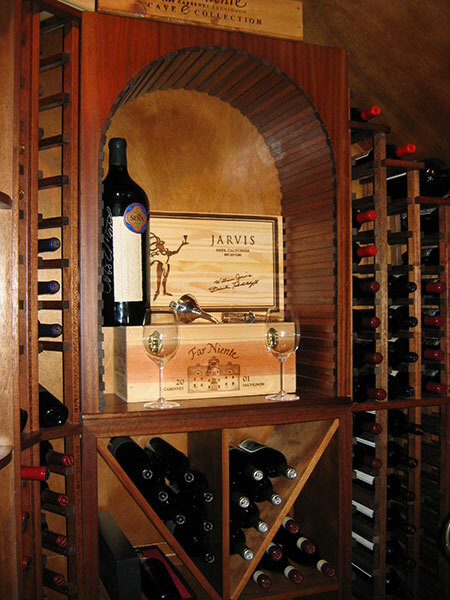 WineRacks.com Inc. was founded in the Hudson Valley of New York in 1992 as The Wine Rack Company. 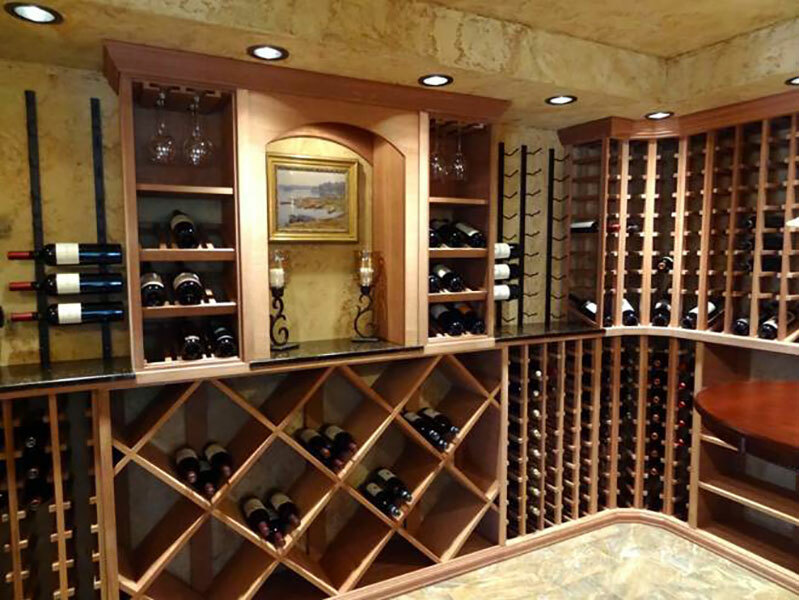 Originally a manufacturer of wine storage products, The Wine Rack Company started its first website (WineRacks.com) in 1995. 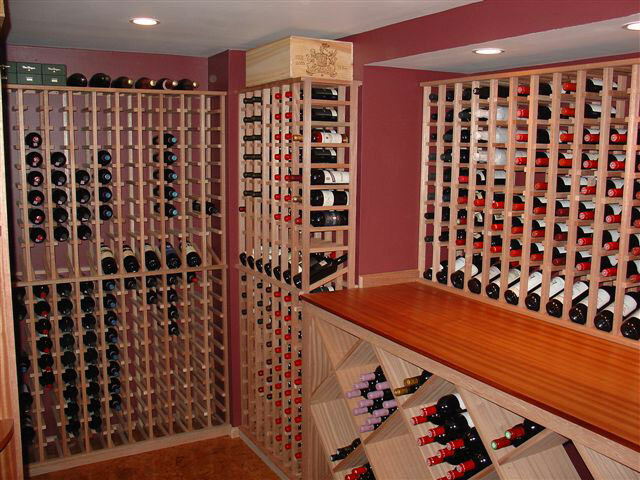 Today, WineRacks.com is one of the premier online retailers of wine storage and wine accessories with an international audience. 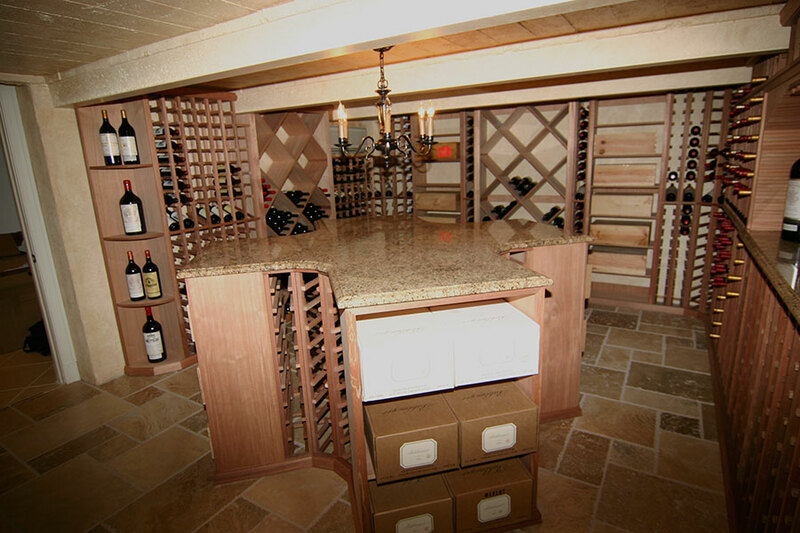 We specialize in custom wine cellars and commercial wine storage as well as smaller racks that will fit in anyone's home. 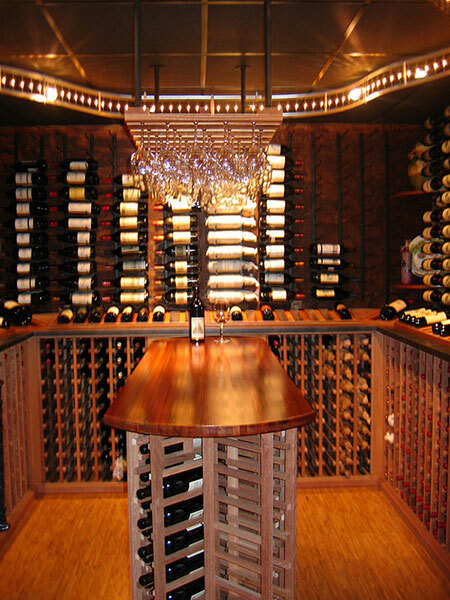 The Wine Rack Company part of our business is still a manufacturer of wooden wine storage, and one of the very few in the industry that manufactures all of its products in the United States from environmentally responsible raw materials. Our goal is to provide the very best customer service and product quality while keeping jobs in the US.